Ashwini LS, Mohandas Rao KG, Saran S, Somayaji SN. Morphological and Morphometric Analysis of Supraorbital Foramen and Supraorbital Notch: A Study on Dry Human Skulls. Oman Med J 2012 Mar; 27(2):129-133. Keywords: Supraorbital foramen; Supraorbital notch; Supraorbital nerve; Craniofacial surgery; Blepharoplasty. In this study, measurements were made on cadaveric dry skulls from South India to determine the location and dimensions of the supraorbital notch (SON) or the supraorbital foramen (SOF). Data obtained were compared with those from other races and regions. The data may be useful to anesthetists and surgeons for providing appropriate nerve blocks and planning the surgical flaps. Eighty-three dry adult human skulls of unknown gender were used for the study. The skulls were collected from the Department of Anatomy, Melaka Manipal Medical College, Manipal, and from the Departments of Anatomy and Forensic Medicine, Kasturba Medical College, Manipal. The study was conducted between June 2009 and March 2011, and approval was obtained from the Institutional ethical committee before study commencement. The skulls were measured bilaterally using “travelling Vernier’s microscope” precision- 10 µ, Sisco, New Delhi, India. 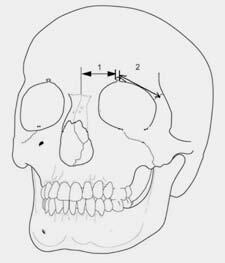 In this study, the parameters studied were distance between the SOF or SON and the nasal midline, distance between the SOF or SON and the frontozygomatic suture, (Fig. 1); height of the supraorbital foramen that is vertical distance between the lowest point along the lower margin of the SOF and supra orbital margin; transverse diameter of supraorbital notch that is transverse distance between the lower ends of medial and lateral margins of the SON; the presence of accessory foramina, their number, location and distance from the main SON/SOF. Figure 1: The measurements of the supraorbital notch/ foramen, in relation to important anatomical/surgical landmarks. “1” indicates the distance from supraorbital notch/foramen to nasal midline and “2” indicates the distance from the supraorbital notch/foramen to frontozygomatic suture. Figure 2: The number of accessory supraorbital foramina on right and left sides. Figure 3: The mean distance between accessory supraorbital foramina and the main supraorbital notch/foramen on right and left sides. Mean distance of medial ASF from the main SOF/SON was 8.62±1.23 mm on the right side and 9.11±1.78 mm on the left side. Mean distance of lateral ASF from the main SOF/SON was 8.75±0.74 mm on the right side and 7.07±0.53 mm on the left side. Mean distance of superior ASF from the main SOF/SON was 3.3±0.41 mm on the right side and 3.08±0.22 mm on the left side. Skulls which were damaged, fractured, deformed or with apparent abnormalities were excluded from the study. The data obtained were analyzed using the statistical software Graph Pad Prism version 3.00, GraphPad Software, Inc. San Diego CA and paired t-test was applied to analyze the difference between the data from right and left sides. Graphical representations of the data were obtained from Microsoft Excel 2007. The study of 83 adult skulls revealed that the SON (69.87%) was found more frequently than the SOF (28.91%). Of all the cases, 56.62% had bilateral SON, while 14.45% had bilateral SOF. Notches were mostly observed on the right side and foramina were mostly seen on the left side. 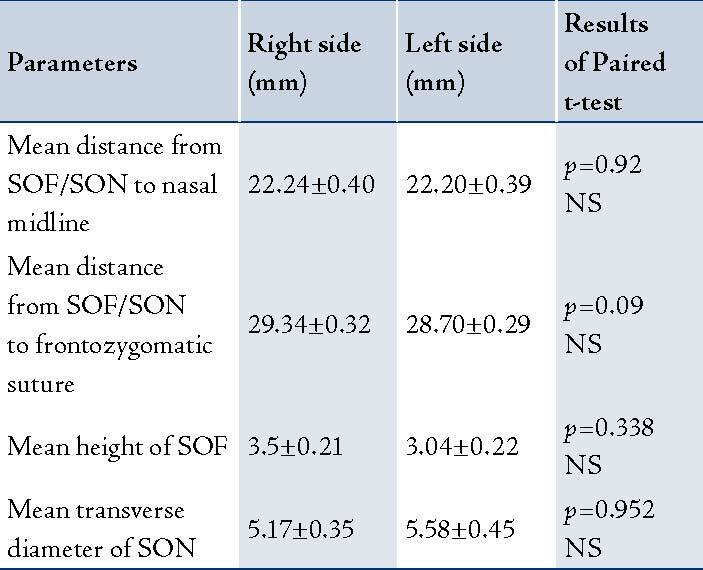 The mean distance between the right and left SON/SOF and the nasal midline; mean distance between right and left SON/SOF and frontozygomatic sutures; mean height of right and left SOF; and the mean transverse diameter of right and left SON are shown in Table 1. When these parameters were compared between the right and left sides, there was no statistically significant difference. 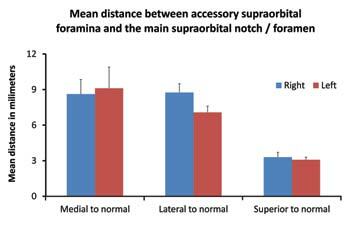 Table 1: Location and dimensions of the supraorbital foramen and supraorbital notch. The SON or SOF is considered to be reliably constant in their location. However, cosmetic surgeons are generally reluctant to perform brow lifts and other open, as well as endoscopic surgical procedures in this region for fear of injuring the supraorbital nerve and subsequent sensory loss.1,9,10 In our study, the SOF/SON measuring approximately 22 mm was observed from the midline, similar with the observations reported in other studies, where the distance between the SOF/SON and the midline was 20-30 mm.10,11 It is interesting to note that in one of the studies conducted on North Indian skulls; the average distance between the SOF/SON and the midline was 24 mm, which is slightly higher than the current observation. However, a much longer (29 mm) distance between the SOF and midline was observed in a study conducted on a Korean population,7 (Table 2). Table 2: Compilation of the different measurements of SOF /SON as reported by the previous studies. Only a few available reports focus on the height and transverse diameter of SOF/SON. In the current study, we found that the mean height of SOF from the supraorbital margin was 3.5 mm on the right side and 3 mm on the left side; while the mean transverse diameter of SON was 5.17 mm on the right side and 5.58 mm on the left side. Gupta reported only the width of the SOF/SON in her study, which was 4.8 mm on the right side and 4.5 mm on the left side; which is approximately 1 mm less than the current observations.1 A study on Thai skulls has also revealed similar results, where they observed the SOF to be 2.81 mm and the SON 4.31 mm wide.11 Webster et al. have reported the height of SOF as 2.02 mm, width of the SON as 5.7 mm and the width of the SOF as 3.78 mm,16 (Table 2). The size of the SOF/SON may reflect the thickness of the supraorbital nerve and the caliber of the supraorbital vessels. It has been observed that the supraorbital notches which were less than 5 mm in width showed at least one accessory foramen indicating the early division of the supraorbital nerve and their exit through the accessory foramina. The occurrence of accessory supraorbital foramina is very common and is well documented. In our study, small additional openings medial, superior and lateral to the SOF/SON were observed in 66.25% of cases. This is relatively on the high side, compared to that of North West Indian population which was approximately 14%.1 Among other reports, Saylam et al. 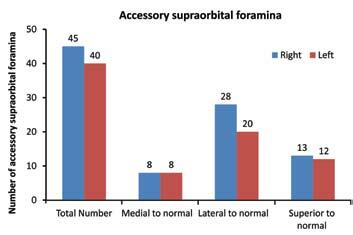 have found them in 21.2% of cases and Berry observed them in 50% of cases.4,25 As far as location of these accessory foramina is concerned, a majority of them (62.22% on the right side and 50% on left side) were found lateral to the SOF/SON. A similar observation was made by Gupta, who observed 84.6% of them lateral to the SOF/SON.1 However, Saylam et al. and Cheng et al. have observed most of the accessory foramina medial to the SOF/SON.4,11 The accessory foramina transmit the minor twigs of the supraorbital nerve which arise within the orbit and are responsible for incomplete analgesia following the injection at the SOF/SON. Overall, it can be stated that the position of the SOF/SON is not constant and it varies between different races and people of different regions. SON is observed more frequently compared to the SOF, though there is a slight difference in the frequency rate among the studies conducted in different regions and race groups. The occurrence of accessory supraorbital foramina is very common and is more frequently seen lateral to the main SOF/SON. Because of these variations of the exit point(s) of the supraorbital nerve and its branches; all the surgical procedures involving the supraorbital rim and adjoining areas have to be performed very carefully with the awareness of probable variations. The authors declared no conflict of interest and no funding was received for this work. 1. Gupta T. Localization of important facial foramina encountered in maxillo-facial surgery. Clin Anat 2008 Oct;21(7):633-640. 2. Pareja JA, Caminero AB. Supraorbital neuralgia. Curr Pain Headache Rep 2006 Aug;10(4):302-305. 3. Cutright B, Quillopa N, Schubert W. An anthropometric analysis of the key foramina for maxillofacial surgery. J Oral Maxillofac Surg 2003 Mar;61(3):354-357. 4. Saylam C, Ozer MA, Ozek C, Gurler T. Anatomical variations of the frontal and supraorbital transcranial passages. J Craniofac Surg 2003 Jan;14(1):10-12. 5. Caputi CA, Firetto V. Therapeutic blockade of greater occipital and supraorbital nerves in migraine patients. Headache 1997 Mar;37(3):174-179. 6. Beer GM, Putz R, Mager K, Schumacher M, Keil W. Variations of the frontal exit of the supraorbital nerve: an anatomic study. Plast Reconstr Surg 1998 Aug;102(2):334-341. 7. Jeong SM, Park KJ, Kang SH, Shin HW, Kim H, Lee HK, et al. Anatomical consideration of the anterior and lateral cutaneous nerves in the scalp. J Korean Med Sci 2010 Apr;25(4):517-522. 8. Standring S, Ellis H, Healy JC, Johnson D, Williams A, Collins P, et al, eds. Gray’s Anatomy: The Anatomical Basis of Clinical Practice. 39th Edition, Elsevier, Churchill Liwingstone, London. 2005: 511-513. 9. Rosenberg GJ. The subperiosteal endoscopic laser forehead (SELF) lift. Plast Reconstr Surg 1998 Aug;102(2):493-501. 10. Erdogmus S, Govsa F. Anatomy of the supraorbital region and the evaluation of it for the reconstruction of facial defects. J Craniofac Surg 2007 Jan;18(1):104-112. 11. Cheng AC, Yuen HK, Lucas PW, Lam DS, So KF. Characterization and localization of the supraorbital and frontal exits of the supraorbital nerve in Chinese: an anatomic study. Ophthal Plast Reconstr Surg 2006 May-Jun;22(3):209-213. 12. Agthong S, Huanmanop T, Chentanez V. Anatomical variations of the supraorbital, infraorbital, and mental foramina related to gender and side. J Oral Maxillofac Surg 2005 Jun;63(6):800-804. 13. Apinhasmit W, Chompoopong S, Methathrathip D, Sansuk R, Phetphunphiphat W. Supraorbital Notch/Foramen, Infraorbital Foramen and Mental Foramen in Thais: anthropometric measurements and surgical relevance. J Med Assoc Thai 2006 May;89(5):675-682. 14. Liu DN, Guo JL, Luo Q, Tian Y, Xia CL, Li YQ, et al. Location of supraorbital foramen/notch and infraorbital foramen with reference to soft- and hard-tissue landmarks. J Craniofac Surg 2011 Jan;22(1):293-296. 15. Smith JD, Surek CC, Cortez EA. Withdrawn. Localization of the supraorbital, infraorbital, and mental foramina using palpable, bony landmarks. Clin Anat 2010 May;23(4):495. 16. Webster RC, Gaunt JM, Hamdan US, Fuleihan NS, Giandello PR, Smith RC. Supraorbital and supratrochlear notches and foramina: anatomical variations and surgical relevance. Laryngoscope 1986 Mar;96(3):311-315. 17. Carolineberry A, Berry RJ. Epigenetic variation in the human cranium. J Anat 1967 Apr;101(Pt 2):361-379. 18. Kazkayasi M, Batay F, Bademci G, Bengi O, Tekdemir I. The morphometric and cephalometric study of anterior cranial landmarks for surgery. Minim Invasive Neurosurg 2008 Feb;51(1):21-25. 19. Chung MS, Kim HJ, Kang HS, Chung IH. Locational relationship of the supraorbital notch or foramen and infraorbital and mental foramina in Koreans. Acta Anat (Basel) 1995;154(2):162-166. 20. Chrcanovic BR, Abreu MH, Custódio AL. A morphometric analysis of supraorbital and infraorbital foramina relative to surgical landmarks. Surg Radiol Anat 2011 May;33(4):329-335. 21. Standring S, Borley NR, Collins P, Crossman AR, Gatzoulis MA, Healy JC, et al, eds. Gray’s Anatomy: The Anatomical Basis of Clinical Practice. 40th Edition, Elsevier, Churchill Liwingstone, London. 2008: 409. 22. Tubbs RS, Loukas M, Shoja MM, Cohen-Gadol AA. Refined and simplified surgical landmarks for the MacCarty keyhole and orbitozygomatic craniotomy. Neurosurgery 2010 Jun;66(6)(Suppl Operative):230-233. 23. Turhan-Haktanir N, Ayçiçek A, Haktanir A, Demir Y. Variations of supraorbital foramina in living subjects evaluated with multidetector computed tomography. Head Neck 2008 Sep;30(9):1211-1215. 24. Hanihara T, Ishida H. Frequency variations of discrete cranial traits in major human populations. IV. Vessel and nerve related variations. J Anat 2001 Sep;199(Pt 3):273-287. 25. Berry AC. Factors affecting the incidence of non-metrical skeletal variants. J Anat 1975 Dec;120(Pt 3):519-535. 26. Huanmanop T, Agthong S, Chentanez V. Surgical anatomy of fissures and foramina in the orbits of Thai adults. J Med Assoc Thai 2007 Nov;90(11):2383-2391. 27. Guyuron B, Varghai A, Michelow BJ, Thomas T, Davis J. Corrugator supercilii muscle resection and migraine headaches. Plast Reconstr Surg 2000 Aug;106(2):429-434, discussion 435-437. 28. Guyuron B, Kriegler JS, Davis J, Amini SB. Comprehensive surgical treatment of migraine headaches. Plast Reconstr Surg 2005 Jan;115(1):1-9. 29. Janis JE, Ghavami A, Lemmon JA, Leedy JE, Guyuron B. The anatomy of the corrugator supercilii muscle: part II. Supraorbital nerve branching patterns. Plast Reconstr Surg 2008 Jan;121(1):233-240.